CHAOS WAR tie-in! The Vision. Captain Mar-Vell. Yellowjacket. Deathcry. Swordsman. Dr. Druid. All lost their lives in the line of duty...or in disgrace. 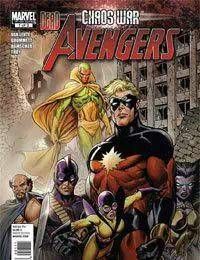 When Earths Mightiest Heroes are themselves laid low in the carnage of the CHAOS WAR and the graves give up their dead, these six find themselves mysteriously returned, to RE-ASSEMBLE against the CHAOS KINGs most fearsome ally -- one of the Avengers greatest foes! Its a final chance at redemption, a second life, and most importantly, to prove -- once and for all -- that they are worthy of the name... AVENGERS.